With more than 600 games each round it's a real challenge to keep up with the action from the Chess Olympiad, especially if you can't stay glued to your monitor all day long. The solution? 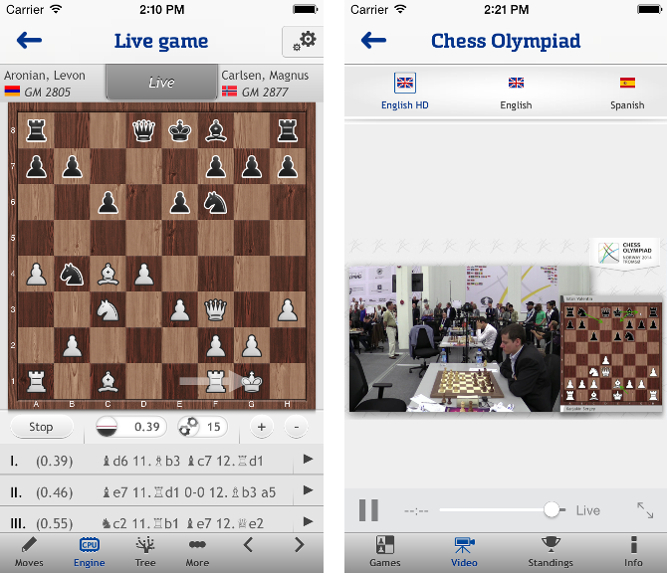 chess24, the official broadcast partner of the Olympiad, has apps for both iOS and Android that provide by far the best mobile viewing experience. You can follow every single game live and even watch all the video commentary by Jan Gustafsson, Lawrence Trent, Einar Gausel and an array of star guests. And best of all: it's free! The tournament overview gives you easy access to all the games from both the current and previous rounds. Tap a match to see the games, tap a game to see the current position, and tap "Engine" to see the computer's evaluation. 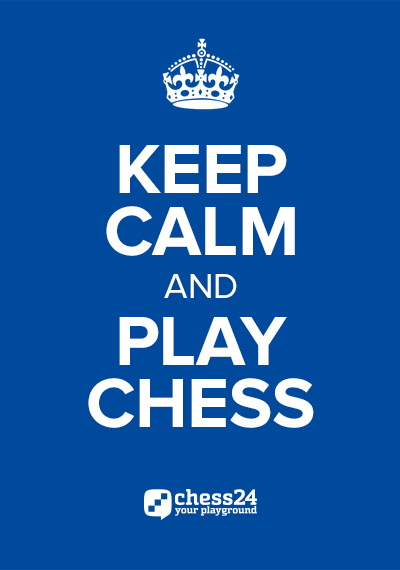 You can make your own moves and even consult an opening tree based on previous grandmaster games. The limitations for non-chess24 premium members are that a single line is shown at a depth of 12, while the opening tree restricted to the first 6 moves (of course for a small fee you can unleash the full power of the analysis tools!). The live video feed is now available in English, Spanish and Russian from within the app. You can watch the action in fullscreen mode, although if your bandwidth is limited you may want to switch from HD to a lower resolution. What else can I do with the apps? Perhaps your team is struggling at the Olympiad or it's too tense to watch. What should you do? Analyse: Games you play and indeed any position you set up can be stored and analysed using a computer chess engine and opening database, making it perfect to analyse your games the moment they're over. The app can also open PGN files. Train: The apps feature our Tactics Trainer, which lets you challenge yourself with thousands of individually tailored chess puzzles. Customise: Your profile and account settings can be controlled via the app. You can also make use of our convenient Facebook login. 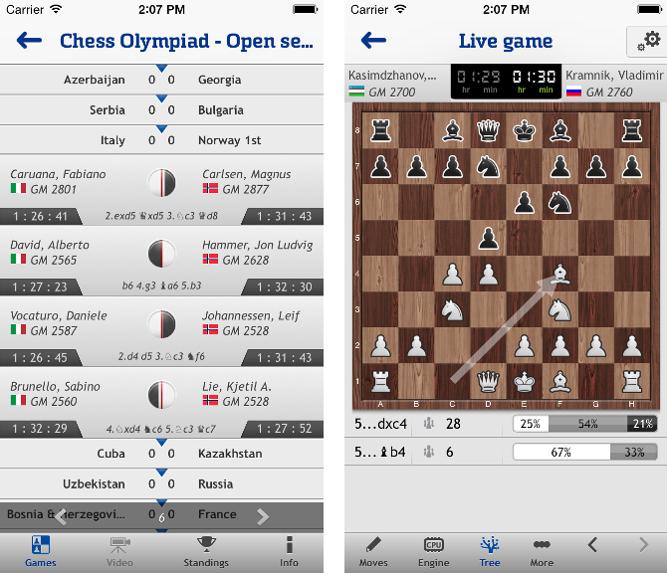 We hope to see you using what we believe is the world's best chess app soon!